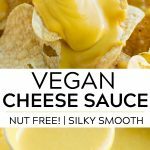 Silky smooth vegan cheese sauce that is also nut free! It’s absolutely perfect over nachos, baked potatoes, steamed broccoli and makes a delicious mac and cheese. What’s the hardest thing for people to give up when they want to go vegan? CHEESE. I hear it over and over again; people can usually imagine going meatless but cheese? That’s a hard one! As a former cheese fanatic, I totally understand! It felt really difficult in the beginning, but now I don’t miss it at all. 9 years ago, when I went vegan, there weren’t as many delicious vegan cheeses you could buy at the store like there are today. Now I can find vegan cheese products at my local discount store. These are exciting times people! All of my vegan cheese recipes to this point have included cashews, because when soaked and then blended with other ingredients, they make a really rich, thick and creamy cheese sauce. I fell in love with cashews awhile back for their ability to create such rich, creamy dishes such as the cheeses above and sour cream. But what’s a person to do that can’t eat nuts? That’s who this recipe is for today! And anyone else who enjoys an ultra-creamy vegan cheese sauce to drizzle over EVERYTHING. Seriously, I was surprised at how good this turned out with such simple ingredients. I hope you love it, too! 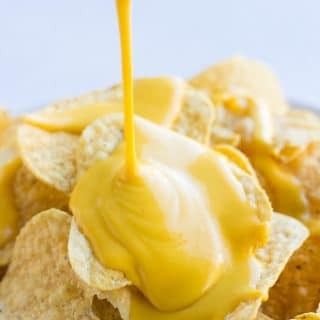 How do you make vegan cheese sauce (nut free!)? Once the potatoes and carrots are fork tender, drain and add to the blender. Blend on high until silky smooth. You shouldn’t need to warm it on the stove, since the potatoes and carrots were hot when you blended it. But if you want, you can add it to a pot and warm, stirring frequently, until it thickens up a bit more. 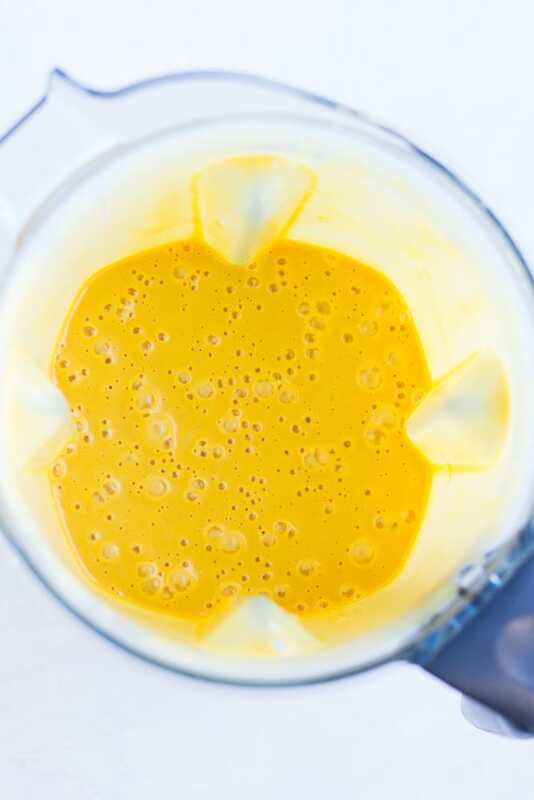 My toddler went crazy over this vegan cheese sauce; he literally could not get enough of it! My older kids were impressed, too. 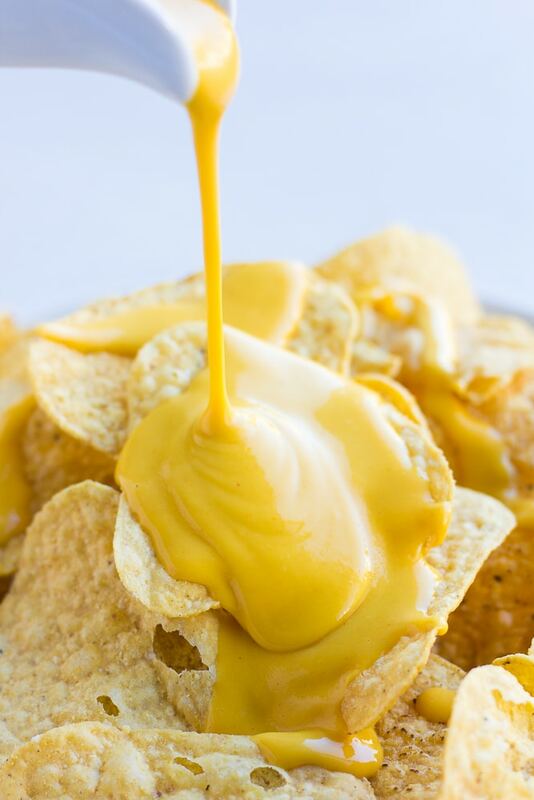 Silky smooth vegan cheese sauce that is also nut free! It's absolutely perfect over nachos, baked potatoes, steamed broccoli and makes a delicious mac and cheese. Add the potatoes and carrots to a medium pot and cover with water. Bring to a boil, and cook for about 10 minutes, until fork tender. While the vegetables are boiling, add all the other ingredients (including green chiles if using) to a blender. Drain the potatoes and carrots and add them directly to the blender with the other ingredients. Blend on high until silky smooth. You don't need to warm it further, but if you want you could add it to a pot to keep it warm. Stir frequently if you do this; it will thicken even more. 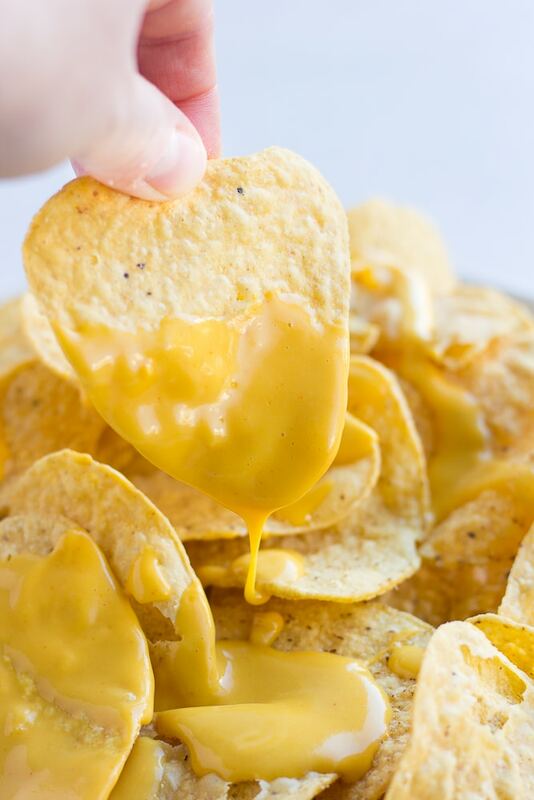 Serve over tortilla chips, drizzle on baked potatoes or steamed broccoli. Mix into macaroni pasta to make mac and cheese! Store leftover vegan cheese in the refrigerator for up to 4 days, if it lasts that long. May also use yukon gold potatoes, you will need 2 small potatoes. 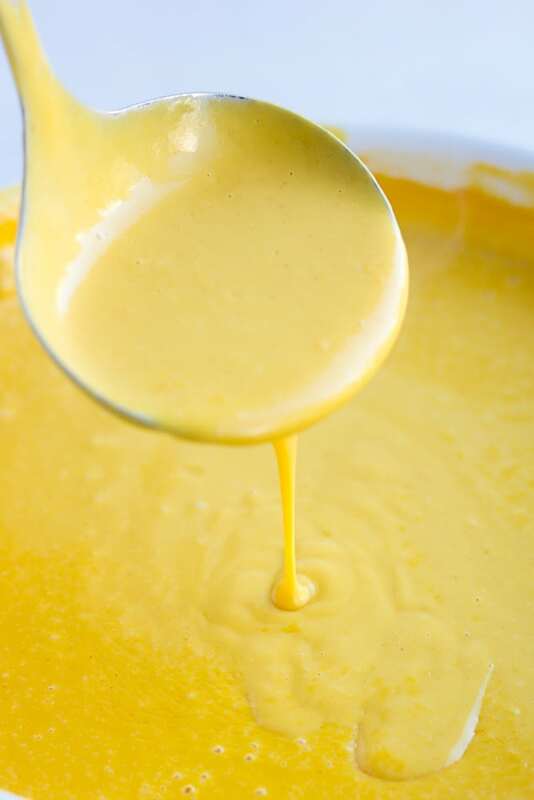 The oil adds some richness to an otherwise low fat cheese sauce, but if you are avoiding oil you may omit it. You can use any unsweetened non-dairy milk that you like, I used coconut milk.